Everyone remember the date of their stroke – mine was 21st July 2015. It was initially thought to be a TIA but was later confirm to be a real stroke. I came home from work, parked up and was getting ready to go out to Weston Bike Night with Liz, my wife. If I had had the stroke whilst driving on the M5 at 70mph it would have been disaster! Before the stroke, I was a fit and healthy man running races and fully involved in the biking culture. 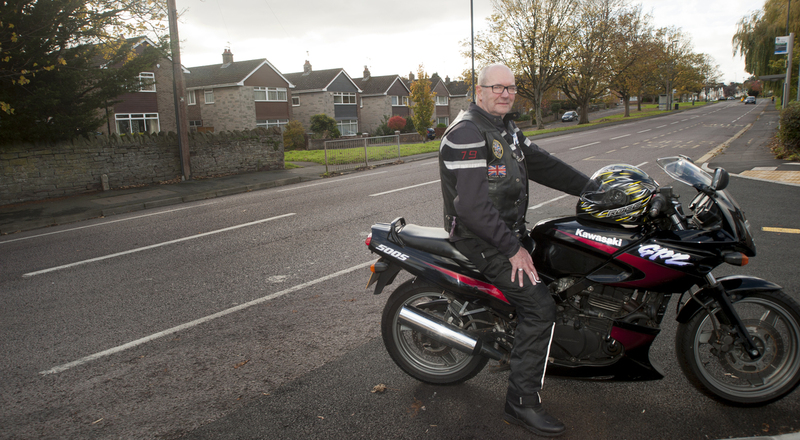 Although I have never driven a car, I have ridden a motorbike for nearly 50 years. One of my biggest concerns after the stroke was getting back onto my bike – that was my real priority. It was essential for getting to work and the centre of my social life. I was Chair of the Christian Motorcyclists’ Association. Since the stroke, I have changed bike three times, eventually found a scooter to be the best option. It’s a big one though – 300cc! I feel like I dodged a bullet with the stroke I had. I was not too affected physically. I have some left-side weakness and long-term fatigue, but it was only after I returned to work in a significantly different role that I realised the psychological impact the stroke had left. I was very depressed and anxious for a while and sought counselling privately. I had been given the Bristol After Stroke leaflet when I was first diagnosed, and eventually through Gill, the Stroke Support Coordinator, attended the South Gloucestershire Stroke Café. It was great but I felt like I didn’t belong – I wasn’t disabled enough! I then attended the ACTion After Stroke course. It helped me to acknowledge the hidden, emotional impact of stroke. Thanks to ACTion after Stroke I am learning to accept my limitations and that I am still in recovery. I’m in a much better place now. The course helped me set goals, and now that I have retired officially, I volunteer for BASF. I help out regularly at the Yate Stroke Group and the South Gloucestershire Stroke Café in Downend. I do it because I want to give something back to an organisation that has really helped me. “It’s still early days” is a bit of a catch phrase, but mine have become Bristol After Stroke ROCKS!